Quick overview The Radeon Vega Frontier Edition workstation graphics card is built for the innovators, creators and pioneers of the world, whose passion is to pursue what is new and different. Based on the latest "VEGA" GPU architecture, this card features four Next-Gen Compute Units (nCUs – 4096 stream processors) and massive 16GB of cutting-edge, second-generation high-bandwidth memory (HBM2). It delivers reality-changing performance that drives the new digital world, nurtures creativity, and paves the way to parts unknown. You can expand the boundaries of what’s possible and witness the impossible. And with the latest features found on the “Vega” architecture at its core, you will have no barriers or compromises to what you want to achieve. 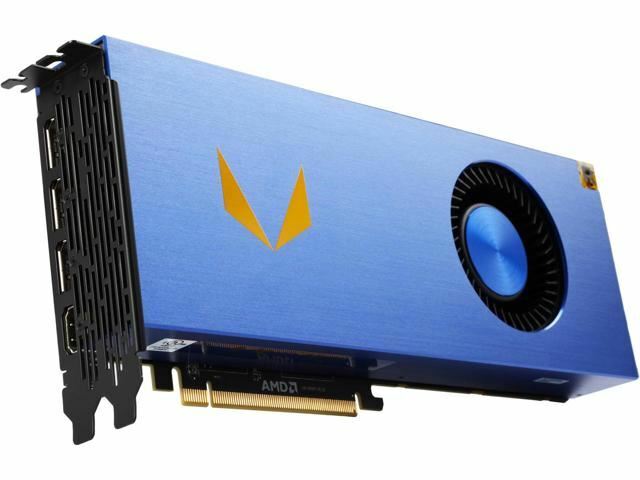 The AMD Radeon Vega Frontier Edition is available in air-cooled (300W max. board TDP) and liquid-cooled (375W max. board TDP) options. This item is the air-cooled model. The Radeon™ Vega Frontier Edition graphics card was the first to feature AMD’s cutting edge “Vega” GPU architecture, purpose-built to handle big data sets and a diverse range of computational workloads. Tremendous compute power to speed up professional applications where high performance is paramount, from rendering video effects to visualizing complex simulations. New compute unit design provides super-charged pathways to provide double the processing throughput when using 16-bit data types, accelerating demanding workloads including image/video processing, ray tracing, and artificial intelligence. Enables professionals to tap into the parallel computing power of modern GPUs and multi-core CPUs to accelerate compute-intensive tasks in leading CAD/CAM/CAE and Media & Entertainment applications that support OpenCL.